Our sophisticated and most advanced design software allows us to engineer and design roof trusses for almost any shape or size. Combine the smarts of our design and engineering with our very strong 90mm ribbed C-sections we can achieve very large span distances and large openings without the need for extensive supporting columns and load bearing walls. All of the Smartsteel frame sections are rolled in our plant using the latest high precision roll forming machine. We only use quality BlueScope Steel TRUECORE® that meets Australian standards and carries a 50 year warranty*. 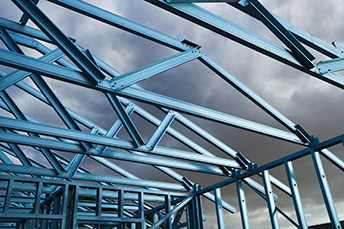 Smartsteel roof truss connections and sections are fully tested in a NATA accredited test laboratory and engineered to meet Australian building codes for cyclonic and non-cyclonic areas. 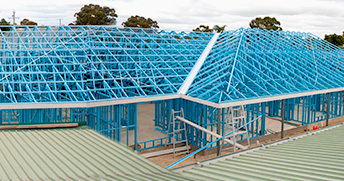 Our trusses can be engineered to suit any roof cladding material. 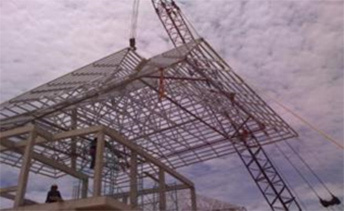 The accuracy and reliability of our steel trusses make the onsite process much more efficient and cost effective by achieving quicker installation time and eliminating costly rectification and adjusting work. Smartsteel wall frames can be supplied fully manufactured and packaged ready for transportation or in complete knock down form for onsite assembly. Make the smart choice by selecting Smartsteel roof trusses and take advantage of many benefits and cost savings. Light weight and easy to install trusses simply screws together without any need for onsite cutting and adjusting. Similar layout and connections to timber trusses making them easy for roof carpenters to install. Smartsteel trusses are up to 40% lighter than equivalent timber trusses reducing OHS site risk and the need for heavy lifting equipment. Smartsteel trusses are termite proof eliminating the need for toxic chemical treatments. Straight and true without risk of warping, shrinking, sagging and roof undulations. Using Smartsteel roof trusses greatly reduces the combustible material in the roof space giving you the benefits of added fire protection.